It took SOMA two years to reach the shore of Microsoft's console, but it is now available and you should definitely check it out if you haven't already. We have captured 2 videos on Xbox One X and pasted our original review inside (with a few updates to it). We've also the commented video we had prepared back in September 2015 if you're interested. SOMA is about many things, mankind, isolation, life and death, but it's also about our past, present and future. Strong themes which will make you think hard all along the 12 hours or so it will take you to complete it. What we can say for sure is that the game has definitely left a mark on us until its very end. The underwater facility in which the story is set and where you'll be looking for answers is incredibly immersive and more and more overwhelming as you progress into it. Before we continue, we should warn you right now that we have no intention to tell you much about the plot and how it unfolds as it would be criminal to do so. The little we know when beginning the adventure should be more than enough, as after all you'll be just like Simon Jarrett, the main character. Indeed, just like you, he has no idea how he's gotten in this forsaken place. He knows who he is, where he was before, but that's about it. Now he's in this crazy situation where some hideous creatures seem to hunt him down somehow and he just wants to understand what's going on. With him, you'll slowly uncover the truth behind all this, you'll hear about men and women, about the Wau, but also about machines and the link between them and us humans in this isolated place. There will be encounters, sometimes friendly, sometimes not, but none of them should leave you indifferent. For those who believed that there wouldn't be much variety in terms of enemies, it's not true. Frictional Games' new title is mainly focused on exploration, so you obviously shouldn't expect dozens of monsters in Pathos II, but the more you'll make your way through the station, the more horrible your enemies will get. The Swedish developers managed to find the perfect balance between exploration and necessary stealth to avoid those creatures, which means every single one of their appearance is well thought of. By the way, if you haven't watched the Creature Trailer they released last week, do stay away from it as it would spoil too many things in our opinion. You don't want to know beforehand what kind of horrors you'll have to face, at least that's how we approached the game when we reviewed it. Contrary to what we supposed in our video preview of the game, death is clearly around every corner in SOMA. The first hit will simply knock you down, leaving you with just a headache, but get attacked once more and you're down for good - and back to the previous checkpoint. Thankfully, Simon quickly finds a way to gain his health back when he sticks his finger (or more - nothing naughty there) inside a very strange looking creature which is both organic and robotic. Now that being said, as opposed to the relief you get in other games in such circumstances, this will make you feel very uneasy. 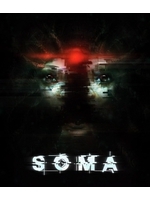 When talking about SOMA, the first word that comes to mind is tension. Walking around what looks more like an anteroom of hell than an underwater facility is quite a nerve-racking experience. One of the game's strongest suit is that the enemies you encounter in Pathos II are mostly unpredictable. Contrary to other stealth oriented titles where enemies all have a predefined round and can rarely take you by surprise, you'll never feel safe here, as if the monster is always on your toes somehow. Even closing doors behind you won't guarantee that they won't open it to enter the room, which means you can't lock them somewhere and hope to be free to explore the area. To add to the overall tension, you have no radar to rely on, you can't see through walls either, which forces you to move very cautiously, leaning around corners (with the combination of RB/R1 and the right analog stick) to make sure the coast is free. If the awful sounds the monsters make aren't enough for you to locate them, you can also use the interferences which appear on screen when they get close - pretty much like the radio in the Silent Hill series. Because you'll never be able to defend yourself against them, exploring an area while a deadly creature is lurking around is quite something. When spotted, running away is a good solution - in the beginning at least -, but once you get to the second part of the game, the enemies are so fast that fleeing can be tricky when you don't know exactly where you're going - or how long it's going to take to open a door. Fear is not just about the menacing monsters though, there's also the fear you are bound to feel when discovering the story of Pathos II and its implications. Some exploration sequences may be free of any direct threat, but it doesn't mean they are not memorable in their own way. The atmosphere is so incredibly immersive that you'll never feel relieved or happy to have left a hostile area. Whether you are in the dark corridors of the facility or under the pressure of the ocean in all the underwater passages, the sound design, the lighting effects and the narration itself truly are amazing. The documents you'll find (written or audio) add more depth (no pun intended) to the world imagined by Frictional Games. A world that is in perfect keeping with the dark tone of the best sci-fi novels or movies. You'll remember with a chill all those moments when you had to do something for your own sake, or when you had to make a decision even if that meant questioning your morals. It is then not fear you'll feel, but inescapable unease. As we said, free will has a bit of a place in SOMA, and that's when you can't help but take a few long minutes of reflection before you can decide what to do. We're not talking about decisions which will affect the story really, only moral implications which will be personal to you as a human being. SOMA isn't the kind of game to go easy on you, it will grab you by the throat and only let go off you when you reach the ending credits (and what follows). 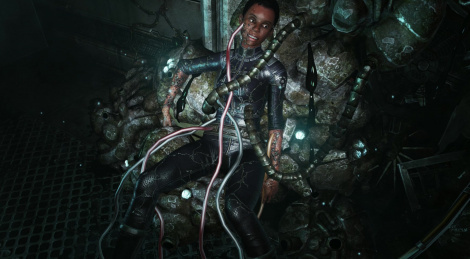 Because SOMA is also an adventure game, you'll be required to do a good variety of tasks to progress through the different stations of Pathos II. You'll have to unlock doors of course, activate different mechanisms or interact with computerized interfaces - to give you a more specific example, you'll have to superimpose two sine waves so they match perfectly by changing several parameters. Nothing too complicated as the game remains pretty linear, but some locations can be a bit bigger to explore, forcing you to thoroughly fumble through the environment in order to move on to the next area. In a way, those sequences offer a welcome relief after an encounter with an enemy, but then again, Simon never really feels safe so you should always be on your guard, no matter what. Again, the balance between every layer of gameplay means the mechanisms never get old, and there is no sense of repetitiveness as there sometimes is in the genre. As we mentioned before, the headaches you'll suffer from won't all be because of the pseudo-puzzles ((it's all very logical and realistic)) you'll have to tackle. The questions raised by SOMA regarding mankind will also join the aquatic ballet, and though not all completely fresh in the sci-fi genre, they are still interesting subjects to think about. The notes you'll find and the audio logs you'll listen to all participate to the building up of tension. More than that, they manage to bring a whole world to life, to make it believable and immersive. The conversations between Simon and Catherine feel very natural, and the relationship between the two takes SOMA close to the likes of BioShock in terms of storytelling. As immersive as SOMA's plot is (again, no pun intended here), it wouldn't have been made possible without the excellent sound design and some solid visuals. Sounds effects are indeed very well crafted, giving each area an unsettling atmosphere, especially if you play with headphones on. Every single moan or creaky sound is like a reminder of the permanent threat that lies in the dark and it's all very effective. While we first had a few concerns about the voice acting, we were more than pleasantly surprised by the cast Frictional Games been cast hired. Apart from a few lines every now and then, it all sounds really convincing and it obviously adds to the overall atmosphere. Whether it's a monologue or a conversation (recorded or live), you'll never to skip anything. What we particularly appreciated were the added dialogs between Simon and Catherine which depend on your previous choices. Visually, SOMA may not be a stunner, but it's still a huge improvement over Amnesia. The lighting effects, the depth of field, it's all very coherent and it gives the game a unique character. We're not sure the PC and PS4 versions received updates after they shipped but the Xbox One X version has been pretty smooth overall, except for the very short drops when the game autosaves or the mini "freezes" when it loads the next area. There are no Xbox One X enhancements that we know of, but it's possible framerate is a bit smoother on Microsoft's latest console than on base Xbox One. After Amensia: The Dark Descent, Frictional Games are back with some serious arguments which will automatically appeal to science-fiction and horror fans alike. Thanks to a good sense of storytelling and a very atmospheric world, the Swedish developers have bested their previous game with quite a memorable title. By putting the player under constant pressure instead of conveying visceral fear (though the more sensitive ones should be terrified alright), SOMA may interest a wider audience than Amnesia, but it still remains a game for the brave. Although the emphasis on story is important, it doesn't mean gameplay mechanics are reduced to their minimum, quite the contrary. Those not particularly receptive to the "walking simulator genre" can rest assured that SOMA is not one of those games. In the end, we can vouch for Frictional Games' new creation and strongly advise you to give it a go as soon as tomorrow. great game with jaw-dropping ending. not that jaw dropping whem its missile telegraphed a thousand miles away, even in mid game it introduces you to the "awap" concept, and in the end you just know how it will go. The story is stellar on how the narrative makes you think, and just doesn't force feed you. too bad the gameplay can even be called mediocre compared to amnesia, and thus all the gameplay traits one awaited were scaled down to just focus the narrative. Its decent if compared to the horrible A machine for Pigs. looks and plays better than amnesia with an infinitely better story to boot. sticks with you the same way silent hill games do. buy it! It is when you're as rich as we are.